^ a b c d American FactFinder. U.S. Census Bureau. 2011年2月4日. 2011年4月5日閲覧. ^ a b c Odintz, Mark. College Station, Texas. Handbook of Texas Online. Texas State Historical Association. 2012年12月3日閲覧. ^ History of the University. Texas A&M University. 2012年12月3日閲覧. ^ Jones, Finn-Olaf. College Station, Tex. p.1F. New York Times. 2006年9月22日. ^ Retail and Entertainment District: Northgate. 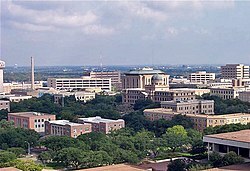 City of College Station. 2012年12月3日閲覧. ^ a b Historical Weather for Bryan, Texas, United States of America. Weatherbase.com. 2012年12月5日閲覧. ^ Type of Government. City of College Station. 2012年12月3日閲覧. ^ City Council. City of College Station. 2012年12月3日閲覧. ^ Bus Routes. Transportation Services, Texas A&M University. 2012年12月4日閲覧. ^ Texas A&M University Facts. Texas A&M University. 2012年12月4日閲覧. ^ Best Colleges 2013: National University Rankings. p.7. U.S. News & World Report. 2012年. 2012年12月4日閲覧. ^ Blair, Sam. A Look Back at the Southwest Conference. Texas Almanac 1998-1999. 2012年12月4日閲覧. ^ Texas A&M Officially Joins SEC. ESPN. 2011年9月26日. 2012年12月4日閲覧. ^ Kyle Field. Texas A&M University. 2012年12月4日閲覧. ^ Reed Arena. Texas A&M University. 2012年12月4日閲覧. ^ About Us. George Bush Presidential Library and Museum. 2012年12月4日閲覧. ^ Visit the Bush School. The Bush School of Government and Public Service, Texas A&M University. 2012年12月4日閲覧. ^ Degree Programs. The Bush School of Government and Public Service, Texas A&M University. 2012年12月4日閲覧. ^ Assessment. College Station Independent School District. 2012年12月4日閲覧.